UK’s property market will be one of the few major markets in the developing world which will experience zero to little growth in the coming few years. There are several factors behind the flat growth, which will be a source of concern for homeowners looking for a fast home sale. However, the four most influential factors are uncertainties caused by Brexit, reduced foreign investor demand, low income growth, and stretched affordability. Contrary to popular perception, the property market in UK did not immediately dived in the immediate aftermath of the Brexit referendum on 23 June 2016. Instead, property prices began to gradually stall in the second half of 2016. It was not until the first quarter of 2017 before a slowdown started to take place. More importantly though, a greater impact has been observed in transaction volume, which indicates lower numbers of recorded sales and purchases finalised. Year-on-year data shows that transaction volume has gone down by as much as 15%. 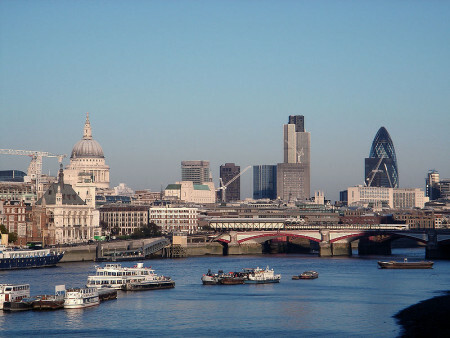 London skyline from the banks of the River Thames. Image courtesy of Wikimedia Commons. The dip has been more pronounced in the London housing market, which has been badly affected by political and economic uncertainties, as well as investor flight. In addition, the recent three percent hike on stamp duty for additional homes has also slightly contributed to the price slump. Moreover, similar to other mature markets, the growth of property prices has moved gradually out of London into the surrounding boroughs. This is not only caused by organic gentrification, but also due to the high cost of living in the capital. In fact, in the last two years alone, property prices in outlying regions have grown nine percent higher compared to four percent in the capital. However, the news is all not doom and gloom. Analysts are not yet anticipating a full blown downturn in the near future. While house prices will not scale the pre-Brexit 7% annual growth, house owners who are planning for a fast house sale can take comfort in the projected 3.7% nationwide annual growth rate. For investors, the outlook may in fact be sunnier in the medium to long term. In a February 2017 White Paper entitled “Fixing our broken housing market”, the government noted that the country’s housing market is effectively broken. The paper highlighted that the cost of an average home is nearly eight times the average income of Britons - stretching affordability for almost 2.2 million British households with income below the national average. The government concludes that the only way to resolve the issue is by building more affordable homes, and has committed to facilitate the construction of 1.5 million new homes across the country by 2022. Not only is this music to the ears of low income families, it is also great news for property investors, we buy your house companies both retail and institutional.